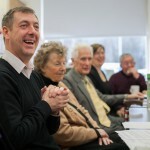 The Scottish Advisory Group on Deafblindness (SAGOD) meets quarterly in different towns and cities throughout Scotland. It was established to make formal meetings fully accessible to members and gives local people the chance to contribute to influencing policy within Scotland. SAGOD seeks to improve the lives of deafblind people within Scotland by seeking to influence policy at a local and national government level. The skills, confidence and experience gained by members taking part in SAGOD meetings has equipped many to go on to serve on our Board of Directors. MSPs, LA Councillors, Social Worker, Health and other professionals interested in the field of deafblindness are invited to come along to the SAGOD meeting in their area. SAGOD provides a unique opportunity to be present at a meeting of deafblind people where their needs are uppermost in the minds of all who are present. 6th March 2019 – 10.30am (Tea/Coffee) meeting 11am – 3pm, Deafblind Scotland Learning and Development Centre, 1 Neasham Drive, Lenzie, Kirkintilloch, G66 3FA. 4th September 2018 (including AGM) – 10.30am (Tea/Coffee) meeting 11am – 3pm, Deafblind Scotland Learning and Development Centre, 1 Neasham Drive, Lenzie, Kirkintilloch, G66 3FA. 27th November 2018 – 10.30am (Tea/Coffee) meeting 11am – 3pm, Deafblind Scotland Learning and Development Centre, 1 Neasham Drive, Lenzie, Kirkintilloch, G66 3FA.